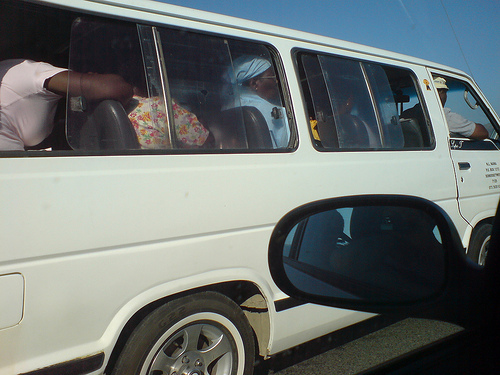 Overcrowded buses pose a serious risk to road safety on South African roads. Photo by mikemedia. In response to the United Nations launching the Decade of Action for Road Safety this week, many countries have been making policy and planning decisions to incorporate road safety as a primary item on their governing agenda. This post focuses on efforts in Africa. One example of introducing road safety to the public realm comes from South Africa’s transport industry. According to Afrique en ligne, an online African news source, the South African road transport industry implemented the Road Transport Management System (RTMS) to reduce road deaths. The system is a voluntary self-regulation scheme that encourages consignees, consignors and road transporters to implement a management system that preserves road infrastructure, improves road safety and increases productivity, Afrique en ligne reports. While recognizing the efforts of RMTS, Transport Minister Sibusiso Ndeble identified overloaded motor vehicles as a major threat to road safety. “Overloaded heavy motor vehicles are daily involved in numerous road crashes and impact negatively on the road condition,” Ndebe said in an interview with Afrique en ligne. RTMS aims to address such issues by showing transport companies how to take corporate responsibility for road safety. Ndebele further acknowledged poorly maintained vehicles, weakly secured loads and inadequately trained or exhausted drivers as additional dangers posed to road safety. With an estimated 44 percent of vehicle crash fatalities in 2004 resulting from speed-related accidents, the loss of human lives is by far the most valuable cost of a lack of road safety. However, it is only a partial burden in comparison to the financial cost of road crashes, as well as the inconvenience and time lost due to road closures, Afrique en ligne cited Ndebele saying. Fatal crashes cost South Africa R13.73 billion (US $2 billion) between 2006 and 2007. Such grim statistics are further proof that cities must make drastic changes to improve road safety for citizens. Besides South Africa, Ghana is also hosting high profile events to endorse the Decade of Action for Road Safety. Ghana’s National Road Safety Commission (NRSC) met with stakeholders in April to finalize the “Development of 2011 to 2010 National Road Safety Strategy (NRSS III),” ghanamma.com reports. According to the report, Ghana has recorded 11,400 road traffic accidents annually with 1,800 fatalities and 14,000 injuries nationwide. With a motorization rate double its amount of over a decade ago, David Osafo Adonteng, the Director of Research, Monitoring and Evaluation, is keen on reducing fatalities. Motorization has been increasing at a rate of 10 percent and rose to 1.2 million in 2010 from 567,780 in 2001, ghanamma.com adds. Although Ghana has seen high fatality rates due to a lack of road safety, the country is doing better in comparison to some of its peers, like Ethiopia, Togo, Tanzania and Niger. Ghana is currently in the thirteenth position for road fatalities, the article claims. But Adonteng recognizes that true results will need more than endorsements and verbal commitments. To truly see results the country will have to make financial investments into road safety programs and sound infrastructure. “It also calls for a vigorous hunt for accelerated investment of sufficient funds for sustainable road safety programmes and activities consistent with the global best practices that are five percent of annual revenue from the road fund, five percent from motor insurance premium, five percent from vehicle registration and inspection,” Adonteng explained. Nigeria is another African country who has suffered its share in road safety fatalities. According to the Nigerian Tribune, 85 percent of deaths of young people are caused by road traffic accidents. Joop Goos, the president of La Prévention Routière Internationale (PRI), an international non-governmental and non-profit road safety organization, recognized the extreme burden developing nations face in dealing with road safety issues during the International Road Safety Forum in Nigera. Goos explained to the forum crowd that the World Health Organization predicted the number of road traffic fatalities in low and middle income countries to rise to 83 percent over the period of 2000 to 2020. In response to Nigeria’s realities in facing road fatalities, Vice-President Namadi Sambo will host an event in Abuja endorsing the UN launch of the Decade of Action, the Nation reports. Though significant, this won’t be Nigeria’s first efforts in recognizing the global initiative. The Nigerian Federal Road Safety Commission (FRSC) activated its Decade of Action plans back in April with a stakeholders forum. The event brought together civil society, non-governmental organizations, private sector, media and academia to look at the challenges facing road safety in Nigeria, the article explains. The result was a plan of action to lead Nigeria in attaining the UN mandate of a 50 percent reduction of fatalities by 2020.